It’s not easy being the servant of two masters, but it makes for a lot of wacky fun! 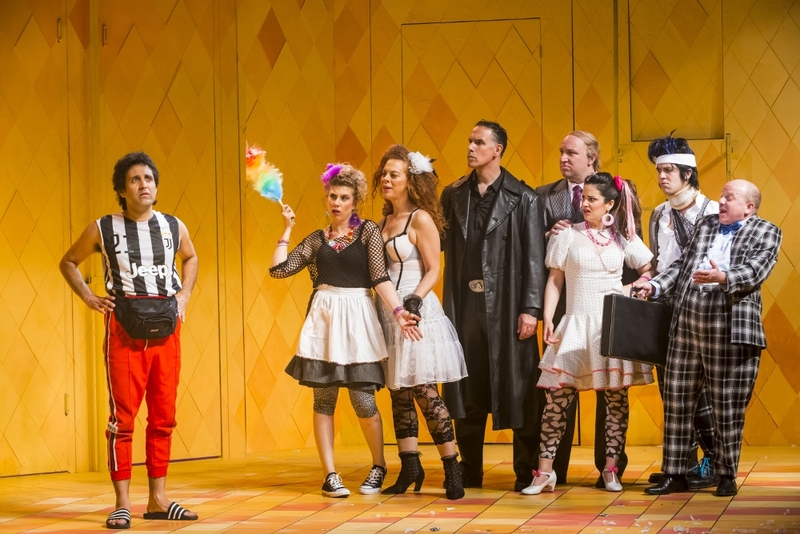 Beit Lessin’s production of Goldoni’s play, directed by Udi Ben Moshe, is marked by exuberant physical comedy and hilarious performances by the entire cast. Carlo Goldoni’s The Servant of Two Masters draws on the Commedia dell’arte, a theatrical form which relies on stock characters whose persona moves the plot along: Pantalone, the rich, miserly, greedy old man, the lovers and of course, the servants, who constantly trick the masters and steal the show. Traditionally, these characters were performed with masks; Goldoni took off the masks and let his characters develop beyond the archetypes. The plot is romantic and complicated, with many obstacles along the way. Pantalone’s daughter Clarissa and Dr. Lombardi’s son Silvio are in love, but Pantalone has promised Clarissa to his business partner, Federigo Rasponi. As luck would have it, Rasponi has been killed in a fight, and the play opens with the young lovers’ engagement. In the midst of the celebrations a stranger arrives and announces that he is Truffaldino, the servant of Rasponi, who is alive and well and newly arrived in town. Cue major freaking out and mayhem. But that’s not all… there’s at least one more pair of lovers in trouble, and another stranger arriving in town. The play of hidden identities, intrigue and conflicting loyalties make a very entertaining show. 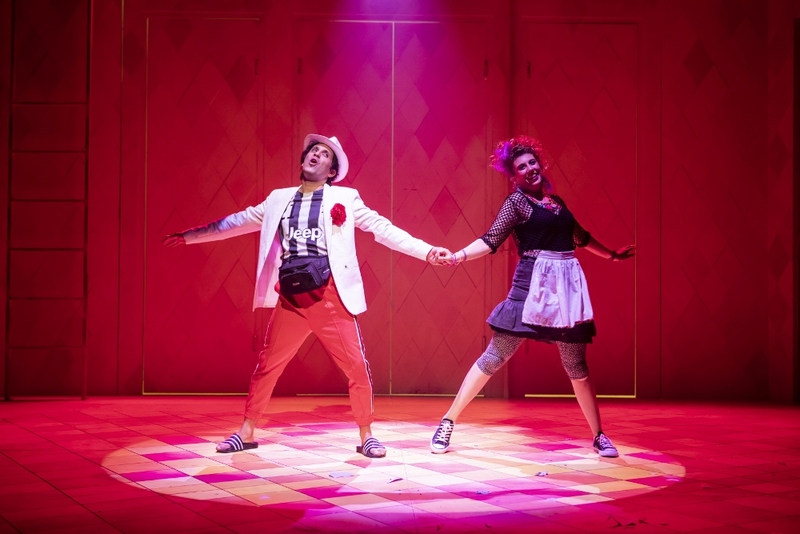 At the center of it all is Truffaldino (Yaniv Biton), whose character is based on Arlecchino (Harlequin), the trickster comic servant known for his verbal and physical agility. Arlecchino is typically recognized by his colorful costume of diamonds in a repeating pattern, echoed here in Svetalana Berger’s deceptively simple set design, with its lively orange and yellow Harlequin pattern. Yaniv Biton’s Truffaldino is attired in a more typical contemporary Middle Eastern style, he looks like the kind of guy you might find hanging out on one of Tel Aviv’s beaches, bars or falafel stands. Biton is quicksilver, as swift on his feet as he is with the one-liners he tosses out with impeccable timing and a look of innocence. His verbal acrobatics are laugh-out-loud funny and have a very spontaneous feel. His antics are hilarious, and his agility in the lunch scene impressive. Biton is a delight! The servants are key elements in this comic world and Shiran Huberman’s Smeraldina is very funny and brings a note of sweetness to her role as Pantalone’s servant. Liron Baranes strikes an imposing figure as Florindo, and is then all the more hilarious as he beats his servant Truffaldino to the tune of Hey Mambo, or expresses his grief in another musical sequence, this time to Puccini’s Nessun Dorma. By Carlo Goldoni; Hebrew version by Nissim Aloni; Directed by Udi Ben Moshe; Set design: Svetlana Berger; Costume design: Orna Smorgonsky; Music: Asaf Roth; Lighting design: Ziv Voloshin; Movement direction: Ariel Wolf; Assistant director: Cnaan Eliel; Cast: Yaniv Biton – Truffaldino, Liron Baranes – Florindo Aretusi, Yuval Yanai – Pantalone, Sivan Sasson – Beatrice Rasponi, Ofir Weil – Dr. Lombardi, Shiran Huberman – Smeraldina, Yotam Kushnir – Silvio, Yael Sztulman – Clarice, Gal Dorenfeld – First Waiter/First Porter, Adi Zak – Second Waiter/Second Porter. Where is this being perform?